Among other extracurricular activities, Formlabs engineer Matt Keeter enjoys making DIY electronic devices. 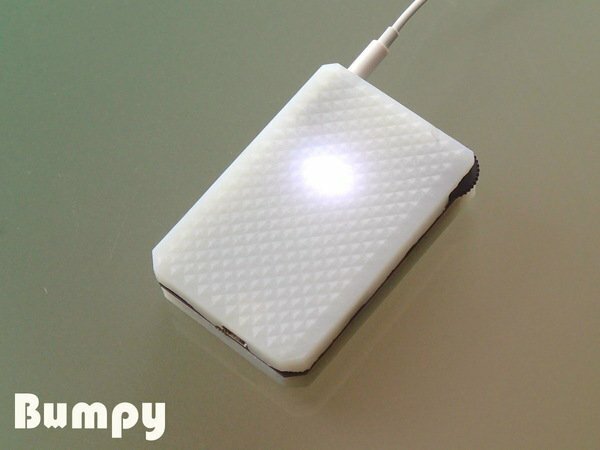 His latest creation is a super-simple mp3 player nicknamed “Bumpy”. It’s an open-source hardware project with design files available on the project's homepage. Though the electronics and firmware are neat, the case really stands out. It was printed in-house on a Form 1, using Formlabs White resin and PreForm’s automatically generated support structures. We caught up with Matt (he works downstairs, so it’s not hard) to chat with him about his project. What were your main design considerations for this project? One of my goals for this project was to make something that looked like an actual consumer product. I didn’t want to finish the project with a bunch of bare circuit boards &ndash; I wanted to make a complete package, including the case. In designing the case, I was trying to make it as thin and minimal as possible. The two case halves are bonded directly to the bare circuit board, and are very thin. The back case is only about 1mm thick where it presses up against the battery, and the top has small cutouts on the order of 1mm to fit electronics on the circuit board. The eponymous texture was actually an after-thought. I printed a few versions with flat tops and bottoms but thought that it needed a little more character. It’s fairly subtle: the individual bumps are only 2 x 2 x 0.3mm, but it came out great. How did the printing go? There were a few self-inflicted issues with early prints, because I turned down support point touch size to minimize the amount of post-processing I would need to do. Unfortunately, this led to parts breaking off of the supports mid-print. Once I reverted back to the defaults, the prints came out on the first try. I also switched from clear to white resin after an early test print, and I’m very happy with how the white resin diffuses the LEDs on the circuit board! What kind of post-processing was involved? The post-processing was very simple: because I printed with the textured side up, all I needed to do was sand the bottom of each part flat so that it could fit cleanly onto the circuit board. The support marks were pretty minimal to begin with, so it wasn’t hard to clean up. Once I got a good fit, I used the resin-glue trick that we’ve mentioned before: I smeared a thin film of resin along the sides of the case, then hit it with a 405nm laser pointer to seal it up. It’s not a very rugged seal, but that’s by design: if I have any issues with the electronics, I can crack it open to get to the circuit board. To check out the documentation and source files, visit the Bumpy project page or look at the PCB and firmware repositories on Github. The whole piece is smaller than a business card! Form with function - two of our favorite things.